dedicated to the twitter lovers. | escaped. dedicated to the twitter lovers. Now, IMO I think this is a bit exaggerating (well partly because I have a Twitter account..hehe) but people entitled to have their own judgement, so it's up to you whether you want to agree with it or not. Personally, I think whatever people do or say on Twitter or how frequent they tweet is up to their own desires because that's the function of the site anyway. If you don't wanna know, don't read. Don't follow. Private your account. That's it. I have a Twitter account but I don't tweet every other second, maybe in average 10 times a day. Simply because I have a life and blog(s). Trust me it's not easy being a student and doing assignments and writing reports and keeping up with updating blogs. (I think this is why most of my friends' blogs have been quite quiet lately) And yea I've only realized this after nearly 3 years of blogging..pfft. If there's one thing I learn from blogging, it's be careful with whatever you write on the net. Stuff on the internet, even the stuff you've erased, is never, ever, EVER gone. EVER. So make sure you want to live with whatever you say. If you think your words might be offensive to some people, password protected them or go private. Or better yet don't publish them at all. Because when you put it out there, you have to deal with it. I'm not even offended by this, I don't know why. 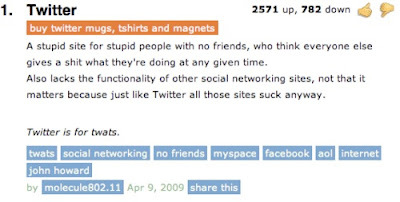 Maybe because I know a lot of people who are tweeting a lot more than me..HAHA. Oh well, celebrities tweet too. best ke twitter nih zatil? dont understand how twitter works.so xgune. hahha sgt lawak explanation yg dierg tulis.lg2 kalo psl celebrities.best gak bace bile malas nak wat pape keje. ahaha i got this from tumblr. btw,anon,try lah twitter!i like it because i can nag there whenever i want and dont feel ashamed because everyone else is doing it too.haha.but thats the thing,i dont usually like to let the whole world know whats on my mind every other min..hehe.